When your pets are home alone, are you sure they’re really there? Really? Put yourself in the position of a beloved pet whose family has just installed a new pet door to the backyard. But instead of the backyard, there’s a teeming city populated entirely by pets. The stores, restaurants, and theaters, the public transportation, the museums, parks, and municipal services are run by a huge assortment of well-dressed cats, dogs, rabbits, mice, hamsters, guinea pigs, ferrets, turtles, fish, and parrots. It is wonderful, but all too soon, it is time to go home. There is one very large problem — how do you get there? 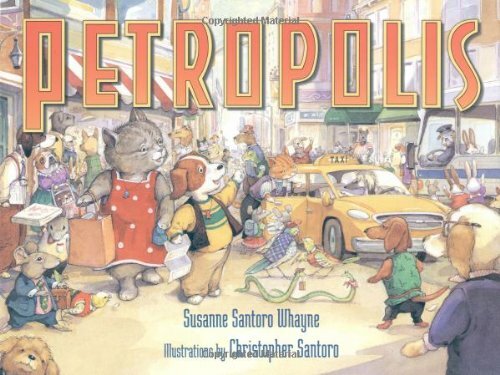 In myriad, strikingly detailed and richly hued illustrations, sister-and-brother team Susanne Santoro Whayne and Christopher Santoro present a highly original, good- humored parallel universe for all young readers to visit, explore, enjoy, and then revisit. Petropolis is a super cute take on the question most pet owners ask themselves: “What does my pet do while I’m away?” In this case they go to Petropolis! A huge city with everything they could possibly want to do. There are restaurants for rawhide pizza and kibble ice cream, as well as a movie theater and even a museum. The art is fantastic, and I love that they chose to do the dogs normal life in black and white, while his adventure in Petropolis is in color. There are a lot of cute things in the background as well, and adds a bit more fun to the story as you find and point out things you might have looked over the first time. 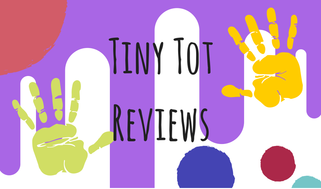 Overall this is a super cute book that is perfect for a child who loves animals and their pets. It would even be a great opportunity to ask them what they think their pets would do while you’re out of the house. Haha this does look cute. Oh this looks adorable..ya know I am on the lookout for books for Sophia. Hmm, I wonder what my rabbit and guinea pig do when we aren’t home?